Cabotine dress in blue and navy mottled print with crossover bodice and beautifully beaded waistband. Dress features v to front and rear and all over layered look which is very flattering to your figure. 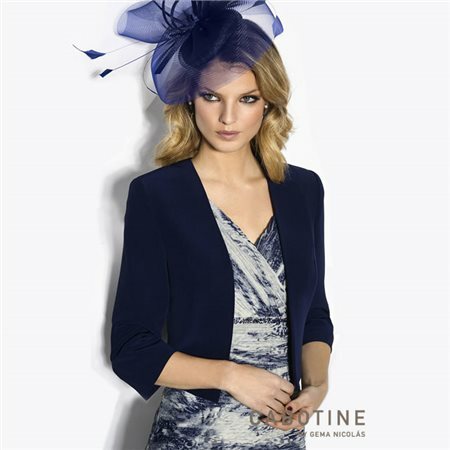 Add the matching Cabotine jacket in navy to complete your look. This stunning Cabotine outfit gives you an understated look thats perfect for a special occasion. Cabotine dress in blue and navy mottled print with crossover bodice and beautifully beaded waistband. Dress features v to front and rear and all over layered look which is very flattering to your figure. Add the matching Cabotine jacket in navy to complete your look. This stunning Cabotine outfit gives you an understated look that's perfect for a special occasion.